Egyptian President Abdel-Fattah El-Sisi accepted on Saturday the resignation of the cabinet of Prime Minister Ibrahim Mahlab, MENA state news agency reported. The cabinet had met earlier on Saturday and decided to submit their resignation to the president, according to Al-Ahram Arabic news website. The president reportedly ordered the cabinet to continue carrying out their current responsibilities until a new cabinet is formed, and asked Petroleum Minister Sherif Ismail to become prime minister and form a new cabinet. Mahlab's cabinet has faced a number of public challenges in recent weeks. Last week, Agriculture Minister Salah Helal was forced to resign and then arrested on charges of corruption. There had also been uncofirmed media reports that other ministers in Mahlab's cabinet might also be investigated on corruption charges. Following the agriculture minister's rsignation, media reports suggested that other ministers might be replaced. However, the cabinet insisted as late as as Wednesday that there were no plans for a cabinet reshuffle in the immediate future. Protests by thousands of government employees against a controversial law regulating the civil service have also continued to dominate headlines in recent weeks. Mahlab was first appointed prime minister in February 2014 by the country’s then-interim president, Adly Mansour, following the resignation of Hazem El-Beblawy. 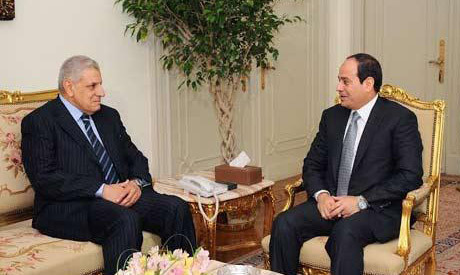 In June 2014, El-Sisi - newly elected president - named Ibrahim Mahlab prime minister again. A cabinet reshuffle in March 2015 saw six ministers exit, including the powerful interior minister, Mohamed Ibrahim. Mr. MAHLAB'S job was to jump from place to place to SUPERVISE and scare the people with his presence but when he left, everything returned to its original state.His job had NO MEAN! The current Cabinet failed in developing and executing an economic plan to provide Egyptians with the 3 basis necessities to build and maintain a state; Food, Jobs, and Education. Instead, they caused and were distracted by Instability, Extremist, and foothold for IS. Two important pieces of advice to the new Prime Minister in forming a new cabinet: Focus on the Economy and Democracy, and control Thug policing and Kangaroo courts. Kudos to President Sisi for listing to the will of the Egyptian people and the hints of the International community. No advice about the elephant in the room the cancer of the Muslim brotherhood terrorists? Oh as a Muslim brotherhood that is a non issue for you a mere distraction as you call it. Your advice is of as much value to Egypt or the Egyptian government as the quality of prison food your MB leadership is getting in their cages.